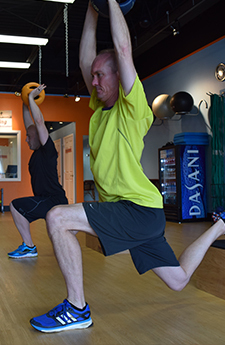 Our 45-minute Personal Training sessions are tailored to fit you, your sport, and your busy life. Whether your goal is to improve performance, lose weight, or alleviate pain when running or walking, our professional trainers can help. Let us discuss with you your goal and get right to work helping you reach that goal! Appointments are held at Fleet Feet Des Peres or St. Charles. For an initial consultation and to learn more about scheduling options, please call Brandi Barbre, Fleet Feet Training Director, at 855-RUN-KWIK (855-786-5945) x703 or complete our inquiry form. We demand the best from our personal trainers so they can demand the best from you. Our personal trainers hold certifications from the Aerobic & Fitness Association of America, the American College of Sports Medicine, the American Council of Exercise, the International Sports Science Association, the National Academy of Speed and Explosion, the National Academy of Sports Medicine, the National Strength & Conditioning Association, and USA Weightlifting. Our professional personal trainers are well-versed in human movement, exercise technique, program design, and nutrition. They help you safely reach your current goals and then appropriately set - and safely attain - higher goals. Personal training is not a luxury. It's a welcome alternative to group training for time-starved athletes. Get maximum results in minimum time with a program designed specifically for you. Workouts that use your strengths and improve on your weaknesses are efficient and effective. Our trainers are experts in holding you accountable. After you set your appointment your trainer will be waiting for you with a vested interested in seeing that you finish your workout and progress toward your goal. Personal training sessions can be purchased independently or in packages of 4, 8 or 12 sessions per month. We serve you at your convenience. “I’m at my best when I work out with Adam two times per week.” - H.P. “After only one personal training session, I’m already moving better and seeing results.” – R.T.
“They have pushed my body further than I ever dreamed possible. At age 49 I'm only getting stronger and faster!” – M.S. “Without the encouragement and motivation from Fleet Feet I would have never stayed with a program like this and am very grateful for everything they have done to help me develop a healthier and more active lifestyle.” – J.A. We understand the life happens and you may have to cancel an appointment. To avoid being charged for a scheduled session, you must cancel your session online or by phone (855-786-5945 x715) within 12 hours of your scheduled time. If you provide less than 12 hours notice or do not show up for a scheduled training session you will be charged for the session.